As a former molecular biologist, I take my hat off to BGI-Shenzhen who managed to sequence the DNA of the virulent German E. coli strain within 3 days. The analysis of the the bacterium's DNA sequence suggests that this is a new type of E. coli strain O104 that contains pathogenic genes from two known nasty strains. It binds to the stomach wall, produces toxins that cause severe diarrhoea, haemolytic uraemic syndrome (HUS) - which results in the destruction of red blood cells - and can affect the central nervous system. In addition, the bacterium contains a whole series of resistances to common antibiotics (described as aminoglycoside, macrolides and beta-lactam antibiotics). The rapid result was achieved using a new method of DNA sequencing, called Ion Torrent, by Life Sciences. When I started sequencing, we used radioactivity to detect and score DNA sequences. By the year 2000 this had been replaced by faster, safer methods using different coloured dyes. Ion Torrent does away with any unusual additives, it measures small changes in pH (acidity). As usual, you begin with your test DNA which has been split into single strands. Synthesis of the complementary strand is then primed in a special microwell plate. The sample is flushed with a solution containing an enzyme (DNA polymerase) and one of the four DNA building blocks (A, T, C or G). If the base can be added to the primed complementary strand, it releases a hydrogen ion. This can be measured and recorded as a small pH change. If the base is not added, there is no release of an ion. The well is then flushed with a second base and again the change is noted. The process is repeated, gradually giving the sequence. Using existing technology, where lots of different DNA fragments can be sequenced in parallel, the process can proceed very rapidly. The different sequences for the DNA fragments are then matched like a giant jigsaw string until you have the full sequence of an organism. 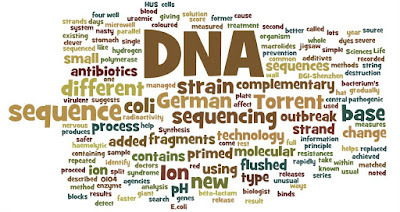 Having this molecular information for the German E. coli type will help doctors and agencies come up with better ways to search for the source of the outbreak and also plan for prevention and treatment. Interesting stuff- let's hope that they find the source soon. Anyone know where to get the read data from these tests? That was awesome! This info gives such a wide knowledge. Actually I was looking for DNA Quantification Kit to identify the risk of developing disease. Thanks.